I have posted this article to call attention to a special project which I have been doing since 1994 and which hopefully will be a source of inspiration for many. Ever since some new disease-resistant varieties of purely American elm were called to my attention, I have been hooked on raising these trees for distribution in my home town of Acton, Massachusetts, and it did not take me long to conceive of finding a way to have them planted in natural settings on various conservation lands, where they always will be safe from indifferent landowners. I soon became acquainted with this town's Natural Resources Director, who welcomed my idea wholeheartedly and gave me the necessary permission. During their usual strolls along the main streets of their home towns, our parents and grandparents gazed at the scenery around them and took for granted a spectacular picture that seldom is observed nowadays and that few of us can hope to see during our lifetimes. The interweaving limbs of the stately trees that lined the streets ascended into a towering canopy with a graceful, arching beauty unmatched by any tree that is commonly seen today, spreading horizontally at heights often greatly exceeding 100 feet (in rare cases attaining 130 feet with even greater spreads and 10 foot trunk diameters), and drooping long, slender branches in abundance high above the street, blocking all view of the sky. Along countless streets for many miles in cities and towns throughout the tree's extensive native range in the eastern half of North America, even as late as the early 1960's, this scene abounded, the effect of the only species capable of giving us such majestic splendor. Veritably the standard against which the merits of other shade trees were measured, the American elm provided the ultimate in stateliness and beauty, making it the single most popular shade tree for lawns and city streets in the eastern United States, and earning it distinction as the state tree of Massachusetts and North Dakota. Architects even designed buildings with elm plantings inherent in their plans. The early citizens of Portland, Maine and New Haven, Connecticut had such a passion for the American elm that they created elm-lined streets on practically every block and earned each city such nicknames as "Forest City" and "City of Elms." Once as naturally abundant as maple, oak, and pine, the American elm was an essential part of our natural landscape and cultural heritage throughout the first few centuries of our history, and it was in fact the first symbol of our national independence; for a fine example had stood in Boston as the famous "Liberty Tree," an emblem of promise and a gathering site for patriotic citizens intent on independence, until British soldiers destroyed it as a final act of hostility during a hurried retreat in 1775. In my home town of Acton, Massachusetts, the elms defined the common, as shown in two photographs from the Acton Historical Society, one depicting Acton Center in 1879, the other depicting Acton Center in 1922 during the annual Acton Fair. At some point, additional and better historical elm photographs perhaps can be incorporated into this article; meanwhile, a few large American elm trees are depicted in my Gallery of Mature Elms. Vast amounts of information could be presented in connection with the historical significance of the American elm, particularly in New England, where plantings of the species were especially concentrated beginning in the 1840's. Perhaps the most extensive and interesting resource for anecdotal information on this topic is the book, Republic of Shade: New England and the American Elm by Thomas J. Campanella (Yale University Press, 2003), a well-researched and illustrated presentation for which, incidentally, I contributed much information on elm restoration that is now mentioned prominently in its closing chapter. Many of us remember how painful it was for our communities to witness the tragedy that recurred throughout the eastern states during the 1950's, 1960's, and 1970's. Many remember watching helplessly as countless main streets, parks, historic sites, and neighborhoods that had been so handsomely graced with fine elms were transformed within a few years into barren, urban-looking landscapes devoid of trees, the result of a frighteningly efficient epidemic that had appeared suddenly. We can imagine the profound dismay of the citizens of Portland and New Haven as each "City of Elms" was transformed rapidly into a "City of Firewood," necessitating almost phenomenal removal expenses. Some may recall marveling at the futility of the "cut and burn campaigns" which were initiated to halt the spread of an epidemic that was killing trees literally by the millions each year. The cause of this pervasive syndrome of wilt and dieback was a parasitic fungus. The spores of the fungus were being deposited into the vascular systems of healthy elm trees through twig-crotch feeding wounds chewed by elm bark beetles, the carriers of the disease. Once in contact with the inner bark, the spores germinated into rapidly growing fungal threads which invaded the entire vascular systems, clogging them and preventing the transport of water and nutrients to the hosts' crowns, thereby killing the trees in a manner not unlike that of the chestnut blight. Unlike the chestnut blight, however, the elm pathogen proved efficient at destroying the root systems of its hosts, preventing them from sending up new shoots, and it even was observed to spread to adjacent trees through natural grafts between their roots. A native of Asia, the fungus first had appeared in North America in 1930 in Cleveland, Ohio, having found its way into the continent by the same means as the chestnut blight - through the accidental import of infected logs from a related species. The parasite was no stranger in Europe, where it similarly had appeared earlier in the century and where its pervasive devastation of a number of European elm species, including the esteemed Dutch elm hybrids which had lined many streets, had given rise to its now-familiar name, "Dutch elm disease." The various elm species native to Asia, where the so-called "Dutch" elm disease originated, are highly resistant to this disease, as healthy specimens are able to manufacture chemicals which prevent the spores from germinating or gaining a stronghold in the inner bark of the trees, and they consequently are able to thrive with little or no stress in the face of generations of exposure to the disease. In its native Asia, the disease actually serves the valuable function of eliminating old or weakened elms to make room for new growth. The Dutch elm disease fungus, like purple loosestrife and water hyacinth, thus provides us with yet another classic illustration of the danger inherent in the introduction of an organism into an ecosystem that is not its own. Nowadays we have to search rather painstakingly to find an occasional large, surviving American elm tree, as the pathogen's destruction of more than 100 million American elms during the last few decades has effectively depleted the population throughout the tree's natural range. Inevitably, the continuing pattern of destruction soon will threaten the survival of the species, for although young saplings are still common, the current population consists primarily of immature specimens with little chance of reaching a stately maturity, and the large, mature examples that still are seen occasionally are being eliminated rapidly. Like the American chestnut, which is now gone from the forest canopy, the American elm has been declining steadily ever since the introduction of a lethal fungal blight, and although the threat of extinction is not immediate, we cannot realistically avoid the conclusion that the last of the sizable, wild American elms likewise will disappear within our lifetimes. The development of purely American elm varieties with adequate resistance to Dutch elm disease remains the only hope for ultimately saving the species, as systematic injection with elm fungicide is an expensive, cumbersome, and unnatural process. It was fortunate, indeed, that such development proved possible and eventually yielded the American elm varieties which now comprise the vital component of my project. In other words, we now have a realistic means to ensure the ultimate survival of the American elm and to bring about the imminent return to the landscape of fine, stately specimens that are likely to survive through the decades. That is the essence of my endeavor, and it is my hope that this writing will help to sow the seeds of this inspiration for others as well. Since 1994, I have been raising these new elm varieties in quantity, and, having obtained the wholehearted approval of my home town's Natural Resources Director, have planted many of them in suitable locations in Acton, Massachusetts. My idea of a suitable location is an open area in which a tree always will remain safe from indifferent landowners and available for public appreciation, preferably in a rustic, natural setting. The attractive and well-maintained Acton Arboretum is one of the more unique features of Acton. Many types of native and exotic trees and perennials have been planted here by the town, and thirteen of the disease-tolerant American elm trees which I have donated are permanently located here, on both prominent and secluded sites. (See photographs.) I also have been given charge of enhancing the naturalistic gardens along this Arboretum's Wildflower Trail. Anyone interested in visiting the Acton Arboretum can view my home-prepared map, which shows the exact locations of the elms which I have donated. 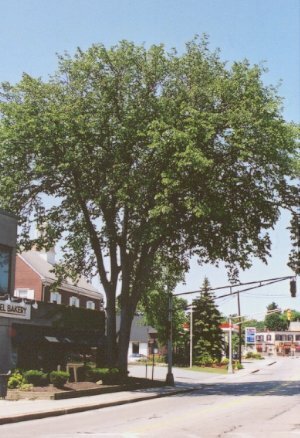 My original plan in 1992 had called for twenty of these trees to be given to the town, and I am pleased to inform everyone that we now have more than forty young American elm plantings distributed throughout Acton in a number of conservation lands and other public places, such as historic Meeting House Hill. While this number of trees may be a milestone worth celebrating, we should not lose sight of the fact that stopping at this number would mean that only so many American elms will be left in the community a few decades from now. That is one reason why my project has remained ongoing in the form of sales to private residences, public departments, tree societies, and similar organizations. Hopefully this effort to inspire others will result in the planting of many more disease-tolerant American elm trees in other towns. Aside from the Acton Arboretum, the Acton conservation lands represented in this project include the Stoneymeade Conservation Area, where six "Valley Forge" elms were planted along the edges of a scenic field in 1999, and the North Acton Recreation Area (NARA Park), where three more trees of this variety were planted in the fall of 2000. (See photographs.) Additional examples of this cultivar are located in fields and clearings on other public lands in Acton, such as the Great Hill, Nagog Hill, and Grassy Pond conservation areas, as well as on privately owned lands along public rights of way. Many of these trees are now fairly large, and some are labeled with convenient tags. The varieties, "Valley Forge" and "New Harmony", each introduced around 1996, are purely American elms (Ulmus americana) from the northern United States which are moderately easy for the amateur gardener to cultivate and to propagate vegetatively. "Valley Forge" appears to be the most DED-tolerant of all American elm varieties that have been released as yet. According to data reported by the USDA, this extraordinary variety can match even Asian elms in its resistance to Dutch elm disease, a trait which should make it likely to survive exposure to this disease throughout its natural life span. This variety's exact place of origin is not known, but to convey an impression of resistance to natural challenge, it was named for the famous land in Pennsylvania where Washington's troops endured extreme hardship in the winter of 1777-78. I have propagated this variety at times with little difficulty, and the Acton Arboretum was given five examples of it in 1998, most of which now are conspicuous and labeled. More than twenty of the American elm plantings on Acton's public lands are Valley Forge elms that I planted between 1998 and 2001. An opportunity to see for myself the DED tolerance of the Valley Forge elm unexpectedly presented itself beginning in 2006, when a fine example which I had planted in Acton suddenly developed extensive symptoms, later confirmed to be DED. Subsequently, the tree's spontaneous recovery was remarkably rapid and complete, as I have described in detail in my article, Valley Forge Elm Proves Itself in Acton, MA. This article is a must-read for anyone with questions about the merits of this variety in terms of DED tolerance. The "New Harmony" variety (named after an Indiana town, though it originated in Ohio) also demonstrated a fairly high degree of tolerance to Dutch elm disease in the same tests performed by the USDA at the U.S. National Arboretum in the early 1990's. The Valley Forge and New Harmony elms are considered suitable at least for USDA hardiness zones 5 through 7, and they may be suitable outside this range as well, although little information concerning this question is available at present. It may be worthwhile to note, however, that at least one nursery has been growing the Valley Forge elm in USDA zone 4b without any problems. The exact boundaries of these zones are depicted on the USDA hardiness zone map. "Princeton," another purely American elm variety, has been in occasional cultivation since the 1920's. Although originally this variety had been selected for its unusually zelkova-like early form and resistance to elm yellows (the only major elm disease going around in North America at that time), before long it was observed also to be surviving exposure to Dutch elm disease repeatedly. The USDA screenings of 1992-93 showed the Princeton elm to be approximately on a level with New Harmony in its tolerance of Dutch elm disease. Its ultimate form, as depicted in my Gallery of Mature Elms, is attractive enough, though to my perception it is not the classic vase shape of the typical American elm. Please see my comparison of the available American elm cultivars for a detailed summary of the important characteristics of each of the American elm varieties that currently are available. The varieties "Washington" and "Jefferson" likewise are depicted in the elm gallery just mentioned. 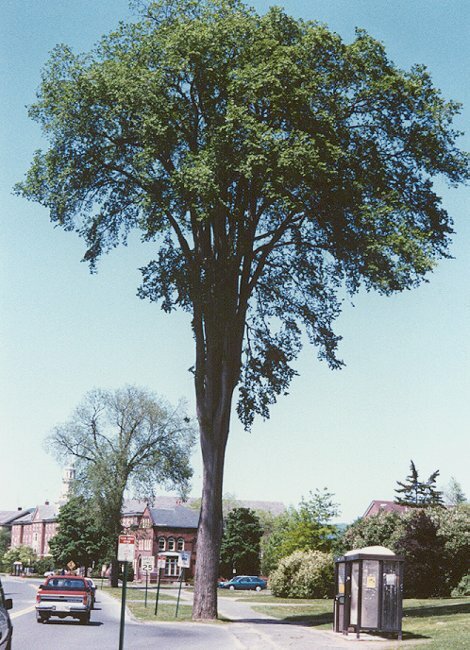 Unfortunately, conflicting sources have created much confusion about the nature of these two varieties; for example, a scientific report from 1994 had claimed based on microscopic examinations that the Jefferson elm is a triploid clone with 42 chromosomes, in contrast to typical American elms, which usually are tetraploid and have 56 chromosomes. The Jefferson elm had been considered for many years to be a possible hybrid between Ulmus americana and another species; however, DNA tests performed in 2004 by the U.S. National Arboretum indicate that it is of American elm parentage exclusively and is likely to be tetraploid, earlier reports notwithstanding. (See more details.) More recent reports by other geneticists indicate that the Jefferson elm is triploid after all, so it seems more than fair to assert emphatically that someone is right! 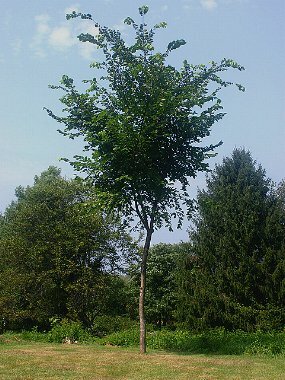 The Jefferson elm (referenced in some reports as "clone N3487") was released to nurseries in 2004 after screening tests showed it to have a high level of tolerance to DED. "Washington" and another variety, "Delaware," also may be available from some nurseries, although to my knowledge neither of these last two varieties ever was released officially. Each of them likewise appears to have a fairly high level of DED tolerance; however, "Delaware" is known to have a relatively low mature form and a problematic branching habit. "Washington" has been regarded as another possible triploid variety and is probably similar to the Jefferson elm in nature and origin. Genetic diversity in available selections is important for the long-term survival of any species, and that may be especially so for the American elm, considering the assortment of characteristics that are generally seen as necessary for a successful establishment of this tree in landscape situations. Unlike the selections mentioned above, an ideal American elm cultivar would combine a high level of DED tolerance with all the essential growth and structural characteristics that would make it easy to propagate and to establish reliably in the field, as well as an attractive mature form - preferably exhibiting the classic ascending vase shape which made this species so popular in the landscape. If at least twenty such cultivars of American elm were released into the public domain and were readily available in nurseries, eventual crossings among them in field plantings could lead to strains with improved DED tolerance derived from multiple genetic sources. With these facts in mind, the USDA Forest Service currently is working each year to screen and to identify many additional prospective DED-tolerant American elm cultivars from among hundreds of seedlings from various controlled crosses involving the Valley Forge and other selections. That program has been ongoing for years and has been proceeding slowly for complex reasons involving occasional shortages of funds as well as the length of time necessary for multiple clones of each selection to reach sizes suitable for screening; but I have heard it said recently by reliable sources that there has been major progress in this important endeavor. That comes as welcome encouragement to those who know the frustration of having worked with American elm cultivars that combine outstanding characteristics with repetitive issues in other areas. The plain fact is that we need better cultivars of American elm in the trade, and lots of them. According to what I have been hearing lately, that is precisely what will be forthcoming from the U.S. Forest Service within a few years - in the early 2020's by my inference. The American elm establishes itself with remarkable vigor. A healthy 3-4 foot sapling planted in favorable conditions can be expected to reach about 25-30 feet in 8-10 years, and perhaps 100 feet in 40 years, with a crown spread of 60-100 feet and an equally extensive root system. Trunk diameter often will gain about half an inch each year, once a tree is established, and it is likely to reach 5 or 6 inches in 10 years, and perhaps 3 feet or more in 100 years. Healthy trees can live for hundreds of years. Anyone interested in viewing an assortment of American elm cultivars at various stages of their growth may visit my elm galleries for some fine photographs. Anyone with a reasonable degree of commitment should be able successfully to plant a disease-tolerant American elm tree, to prune it, and otherwise to maintain it. A sapling newly obtained in the spring or fall is best planted immediately, and in a location which provides all of the preferences of elms, such as direct sun, moderately rich soil with a pH of about 6 to 7, ample moisture, and drainage. If a tree has been received bare-root, the roots should be spread out so that the tree will develop in a well-anchored fashion, and they should be positioned so that their direction is more outward than downward. Ample watering is important for newly planted elm saplings, and in some areas mulching will help to protect them from frost heaving during the winter. Bark mulches contribute to soil nutrition, moisture retention, weed control, and temperature moderation in both summer and winter, whereas woodchip mulches absorb soil nitrogen and are best avoided. Mulching should be done carefully to avoid smothering the base of the trunk under excessively thick layers. Young elms also respond well to plant food solutions applied to the roots a few times each spring, and to granular fertilizers (5-10-5 or 5-10-10 ratio) sprinkled near the trunk each fall. Any leaf wilting following a fall planting of a bare-root elm sapling can be treated as harmless early dormancy, as such trees ordinarily re-sprout fully in the spring. In general, elm saplings that have reached perhaps 4-7 feet in height can be considered ready for planting in permanent locations, which perhaps should be done only in the fall or early spring to avoid the risk of transplant shock. Smaller trees also can be permanently planted in some areas, depending on the nature of the location, but trees for urban sites with a high risk of vandalism probably would be best raised to a safe, large size before being permanently planted. Permanent locations should be selected with the tree's ultimate dimensions and preferred soil and light conditions in mind. The roots of American elm trees generally do not interfere with pavements, even at close proximity, nor with the health of lawns, but the trees will need to be spaced widely enough to allow for adequate expression of their eventual forms. Ideal spacing is probably at least 40 to 50 feet from nearby trees, which is not to imply that closer spacing will produce an inadequate tree in every instance. At least a bushel or two of rich compost or topsoil should be added to the planting hole in many cases, depending on the quality of the native soil. The newly planted tree may need to be staked to keep it straight and secure, and it may need frequent watering during dry periods in the summer. In the winter, a plastic rodent guard will protect a young tree from rabbits and mice. Deer can be a tremendous threat to a young elm sapling, especially during the spring when young shoots are emerging, so the need to repel deer in locations where they prevail cannot be overstated. There are many more deer in most areas than people commonly realize, and elm shoots are one of their favorite foods. Commercial repellents are generally safe for use on young elm trees when applied as instructed. A beaten egg mixed with half a gallon of water also makes an effective deer repellent spray, whether aged or fresh, although it should be reapplied at regular two-week intervals and immediately after rain, and used sparingly when applied to newly emerging shoots. As an alternative to such regular attention, a piece of soap tied in a nylon rag and hung from the sapling at browse level appears from my experience to be highly effective in keeping deer away. Japanese beetles generally are not a substantial threat to the health of an elm sapling unless severe infestations are denuding branches. Although I have seen how these insects can make young elms look somewhat unsightly in July, I have not taken any action against them up to now. If I ever were to change my mind, the first product that I would seek would be milky spore, a safe, organic biological control which can be applied to lawns and gardens with a spreader. Reportedly, a single application of milky spore is extraordinarily effective at stemming Japanese beetle populations in any given area for years. Elm saplings should be pruned each year while they are young, with the goal of developing a sturdy trunk before the main limbs become prominent. The best approach to pruning can vary considerably from one elm variety to another and is described in specific detail (next three paragraphs) for the Valley Forge elm in particular. With American elm saplings generally, branch fullness usually should be encouraged, and in some cases vertical height may need to be sacrificed temporarily to trunk development. Cutting back any low competing leaders or long, reclining, horizontal shoots often tends to encourage fuller branching overall and to prevent the development of a top-heavy or whiplike form - or of weak V-shaped crotches that could split in strong winds or ice storms. Each year, the strongest and straightest shoot should be selected to become the main trunk, and any wood above it should be removed, using only sharp clippers or scissors, as elm bark peels extremely readily. (Wounds to elm bark also heal with surprising speed.) Low side branches are best treated as temporary; leaving them attached for a time may help to promote trunk growth, but they are best removed progressively from below as the tree increases in height. Removing these low branches up to about half the height of the tree, not to exceed the lowest main scaffold crotch, is a useful guideline. Any side branches that are left attached will need to be trimmed back after they have reached a reasonable fullness, to prevent them from becoming overly dominant. When the central leader becomes semi-woody in the summer, it may need to be staked so that it will ripen with a vertical posture. A few people have written to me about the peculiar early growth pattern of the Valley Forge variety, which generally lacks a vertical posture in its first few years after planting, necessitating frequent attention to staking. I had concerns about this trait when I first began working with Valley Forge elms, wondering if it may have undesirable implications about the long-term growth pattern or ultimate form of this clone. Naturally, I hoped that its mature form would have the characteristic ascending grace that made the species so desirable to earlier generations. Now that I have been working with Valley Forge elms for a number of years, it is readily apparent to me from consistent observation that the early arching habit of this variety does not last beyond the first few years of the plant's life when it has been staked and pruned properly. The flimsy curvature which the Valley Forge elm tends to develop in its earliest years is easy to correct by the use of a tall (at least 6-foot) bamboo stake and frequent attention to vertical training and pruning, and given such attention at this early stage, this vigorous clone tends gradually to grow more vertically on its own, as it becomes increasingly established. Indeed, most of the Valley Forge elms which I had planted as two-year-old whips prior to 2003 have been rewarding me with ever more attractive shapes, and they seemingly can be expected to develop the classic vase shape of the species, as depicted at the USDA website dealing with this variety, and in my elm galleries. In fact, the ripened twigs on young elm saplings often can be bent gently by hand into permanent desired positions, much like the "obedient plant" of the perennial garden, as elms appear to have a similar malleable quality. The pruning guidelines described above apply as much to the Valley Forge elm as to any other American elm, but it is important to note that this particular cultivar can become prone to severe upper branch splitting if its lowest branches are left attached for an excessive period of time or are allowed to fill out. Conversely, removing these low branches in a timely manner, progressively up to the first vertical crotch (which usually develops at about 15 feet above the ground in this cultivar), seems to strengthen the wood above them reliably, allowing the tree to develop an attractive, manageable form. The corollary seems clear: When a Valley Forge elm is consistently pruned to a straight, central leader up to at least 15 (or preferably 20) feet above the ground, regularly cutting back or removing any competing leaders or straggling side branches up to that height, it is apparent to me that the tree henceforth will tend to grow to a desirable shape on its own, and without being especially prone to splitting or leaning, though it may benefit from occasional trimming around the edges of the crown for a few more years to keep the tree shapely. (See its 20-year-old form.) This guideline is based on consistent personal experience as well as on past correspondances with a USDA research scientist who had worked extensively with this variety. Eventually, when all side branches below at least the 15-foot height are pruned off (as shown in this photograph), and no branches are emerging directly off to the side from below any of the main limbs, the tree reportedly will take care of itself more reliably. With older Valley Forge elms, I am finding repeatedly that the tree grows especially sturdily in response to being pruned to a central leader even up to 20 feet above the ground, leaving the upper side branches attached, but trimming them back somewhat to suppress any competing leaders up to that height, so that the young tree for the time being looks relatively slender, like a poplar. The all-important factor is to make sure there are no vertical side branches forming major crotches below that height. With such a form, the tree is ready to develop from its upper region the permanent, vertical limbs which soon will spread out to give it the characteristic shape of the species, and it will do so with few if any structural problems. When people find the Valley Forge elm to be overly prone to splitting at weak crotches, I perceive that it is almost always because they have not understood how their trees have needed to be pruned. The importance of proper pruning on this particular cultivar cannot be overstated, but it is easy enough to accomplish, and the eventual reward will be a mature, surviving American elm tree with the classic vase shape that has become something of a rarity in most areas. The disease-tolerant varieties of American elm that currently are available should be propagated only vegetatively, since asexual reproduction ensures genetically identical offspring with the same disease tolerance of the parent plant. Seed propagation generally should be avoided, as this practice yields high percentages of offspring which do not necessarily inherit disease resistance, even from the best parents. The degree of difficulty with which the American elm can be cloned varies with the genetic diversity of the species; some varieties propagate easily. The Valley Forge elm has been supposed to be relatively difficult to propagate vegetatively compared with other American elms, yet my own experiments have demonstrated repeatedly that it too can be cloned without too much difficulty. After much trial and error in the propagation of this variety, I finally had great success, and the easy techniques described below may be of interest to certain nurseries as well as to elm enthusiasts. Stem cuttings offer the advantage of yielding potentially large numbers of offspring without stunting the growth of the parent trees. In my experience with American elms, greenwood cuttings about 8-12 inches in length taken from young saplings during June or July work best, especially if their leaves are cut in half, widthwise. The most viable twigs for this purpose generally appear to be those bearing the darkest leaves and emerging laterally from the lower sides of the tree, as opposed to the vigorous but more lightly pigmented upper shoots. The ends of the cuttings should be inserted about 1-2 inches deep in constantly moist soil, and kept in shade under maximum humidity or intermittent mist for about 4-8 weeks. (Potting soil works well for this purpose.) Although I now use a mist system, I also have had considerable success by setting such cuttings in pots, placing plastic bags tightly over them to maintain high humidity, and poking small ventilation holes in the bags to discourage fungi. After 4-8 weeks in shade, at least 50 percent of my Valley Forge elm cuttings under mist or in bagged pots have rooted for me firmly and fully. Another technique which has worked for me in the past has been to set the cuttings in a shady part of the garden under a glass aquarium propped slightly at the base for ventilation, and to water them every day. It may be worthwhile to note that the rootability of stem cuttings in American elm varies considerably with genetic differences between individual trees. In the summer of 2002, I set about 600 cuttings of the Valley Forge elm, plus several cuttings of the Princeton and New Harmony elms, in pots containing moist potting soil, arranging them in flats in a shady outdoor bed under intermittent mist. By the end of August, I counted from this batch 365 successfully rooted cuttings of the Valley Forge elm, most of which were at least moderately vigorous. I consider a success rate of over 50 percent to be excellent, especially in view of the fact that no rooting hormone was used. A number of the Princeton and New Harmony cuttings rooted successfully also. I also have had good results in propagating the Valley Forge and other American elms by layering. This technique, probably best begun in the spring, is accomplished by pinning a young sapling horizontally along the ground and slightly burying the trunk and the bases of the emerging shoots until they form roots. A similar method of layering which has worked for me occasionally is to remove a few leaves from the middle of a half-ripened stem during the summer and to bend the stem so that the newly denuded portion is buried and pinned in the soil. Either way, the soil must be firmly packed around the buried section, and the protruding tip of the stem should be positioned (and perhaps staked) so that it points upright. Probably at least 6-10 inches of stem should show above the ground so that it looks in every way like a stem cutting, except that it remains attached to its parent. The buried section may root like a cutting after 1-2 months if the soil is kept constantly moist. A distinct advantage of layering is that the entire system always will remain hardy and will not need shade nor the humidity which is so vital to the survival of a stem cutting. After a few months, or perhaps in the following spring, the new plants can be clipped apart from the parent stock and transplanted. In the spring of 2000, I had a number of 3-4 foot, unbranched Valley Forge elms, most of which I was preparing for sale, but I set aside four of these saplings for use in propagation by layering. In May, when their emerging shoots were a few inches long, I pinned their entire 3-4 foot lengths horizontally along the ground, burying the trunks about an inch deep with each shoot protruding from the ground like a stem cutting. (Those shoots which were pointing downward from the main stem were removed.) Having firmed the soil around each shoot, I left these four layering systems in place through the summer and watered each shoot daily. In early August, I clipped one of the layered trunks apart from the parent tree's root system at the base, seemingly a bit too soon, but although the buried shoots showed some stress, they survived, and I noticed a few rootlets protruding from the ground near these shoots a few days later. In the end, my experiment with this technique in 2000 did yield a number of successful propagules, and I believe that an important key to success with elm propagation by layering is to allow an entire growing season for rooting, as opposed to expecting results after a few weeks, as with stem cuttings. Finally, root cuttings taken from dormant trees in the early spring can be sprouted. Root cuttings may be best taken in the spring, since this is the time when the plant's reserve of energy is concentrated in its root system and preparing to generate sprouts, although I have known root cuttings of American elm taken during the summer and fall to sprout as well. Such cuttings probably need to be at least 1/2 to 3/4 of an inch thick and 5 to 6 inches long, and they must be planted carefully in a vertical position with their tips at ground level. In at least one case, I was able to sprout an American elm root cutting much smaller than that. Although root cuttings may be less prolific than other techniques and may tend to stunt the growth of the parent trees, in some clones they also may be more reliable than stem cuttings or layerings. The Valley Forge and New Harmony elms have been slow to be picked up by nurseries since their introduction in 1997, and they currently are available only from a few sources to the best of my knowledge. The list below of sources for DED-tolerant American elm cultivars is not comprehensive, but it represents an entirety of sources which have come to my attention. I too have sold Valley Forge elm saplings for many years and have noted that the demand for this variety is strong, perhaps largely because of its continued scarcity in the nurseries. Since early 2000, I have sold hundreds of young Valley Forge elms to various public departments, organizations, and private residences in every state within the native range of the American elm. The trees from which I have propagated had been acquired originally from two wholesalers, one of which is listed below; the other (Phytotektor in Huntland, TN) closed in 2007. Those who have purchased these saplings from me include individuals from the Glastonbury Elm Project (Connecticut), Dartmouth College, and Elm Watch, a nonprofit organization in western Massachusetts dedicated to documenting, preserving, and restoring American elms. Because of the small size of my nursery combined with recent challenges in connection with my propagation equipment and a lack of availability of stock from wholesalers, it has become necessary for me to pause sales of American elm cultivars for the time being and to refer people to the suppliers listed below. Each can speak for itself as to what it may be able to offer. The email link at the bottom of this page remains available for anyone wishing to correspond with me about specific situations. However, it cannot be emphasized enough that better American elm cultivars are likely to be released into the public domain within a few years, probably with the result that nurseries will pick them up with more enthusiasm than the currently available cultivars have generated. I for one regard the imperfect cultivars as important stepping stones in a long-term process of evolution which is still ongoing and likely to lead to a better situation sooner or later. It is also my hope that when that time comes, I will have been able to prepare an improved nursery ready to accommodate more effectively a new phase of work with new and improved American elms to offer. We perhaps would do well to include an assortment of cultivars in any large-scale elm planting to maximize genetic diversity, and to plant them among a diversity of species to avoid the monoculture conditions that encouraged the epidemic before. 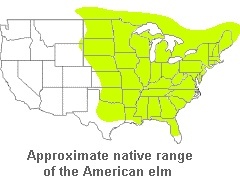 All of the new elm varieties in recent years have been generating a commendable resurgence of public interest in restoring the American elm; however, in their searches for information about the different varieties, many people have encountered controversies between ERI and the USDA about who has the better varieties, with each party appearing to cast doubt on the quality of its competitor's products. The seeming competitiveness was especially pronounced in the late 1990's, and I will speculate no further as to its origin. Having reviewed detailed technical information sent to me by both research teams, and having observed the behavior of various cultivars in the field, I have made reasonable determinations to my own satisfaction and hopefully have helped others to do likewise. Sylvan Nursery, 1028 Horseneck Rd., Westport, MA 02790; 508-636-4573. Wholesale. J. Frank Schmidt and Son Co., 9500 SE 327th Ave., Box 189, Boring, OR 97009; 503-663-4128. Wholesale. Ammon Nursery, 6089 Camp Ernst Rd., Burlington, KY 41005; 859-586-6246. Wholesale. Klyn Nurseries, 3322 South Ridge Rd., Box 343, Perry, OH 44081; 440-259-3811. Wholesale. Angelica Nurseries, 11129 Locust Grove Rd., Kennedyville, MD 21645; 410-928-3111. Wholesale. Millican Nurseries, 187 Pleasant St., Chichester, NH 03258; 603-435-6660. Wholesale. Cavicchio Nursery, 110 Codjer Lane, Sudbury, MA 01776; 978-443-7177. Wholesale. Bold Spring Nursery, 1366 Columbus Highway, Hawkinsville, GA 31036; 478-783-4975. Wholesale. JLPN, Inc., 1118 Lancaster Drive NE #409, Salem, OR 97301; 503-373-9781. Wholesale. L.E. Cooke Co., 26333 Road 140, Visalia, CA 93292; 559-732-9146. Wholesale. Tennessee Valley Nursery, 145 Tennessee Valley Dr., Winchester, TN 37398; 931-967-4541. Bigelow Nurseries, 455 West Main St., Box 718, Northboro, MA 01532; 508-845-2143. Wholesale and retail. Northeast Nursery, 234 Newbury Street, Peabody, MA 01960; 978-535-6550. Wholesale and retail. Speer and Sons Nursery, Box 969, Cornelius, OR 97113; 503-547-8296. Retail. Arborvillage, LLC, 15604 County Road CC, Box 227, Holt, MO 64048; 816-264-3911. Retail. Greenrange Elm Project, 905 Sawyer-Needham Rd., Whiting, VT 05778; 802-623-8603. Retail; large trees only. Sunshine Nursery, 22523 E 1020 Rd., Clinton, OK 73601; 580-323-6259. Retail; trees may be grafted. Sharp Top Trees, 102 Aubrey Rd., White, GA 30184; 770-387-1945. Retail; specialist in Princeton elms. Elm Research Institute, Keene, NH. The Liberty elm specialist. Not recommended; click for details. Before concluding, I would like to inform everyone that we also will have the means to work similarly on the ill-fated American chestnut in the near future, and you can be sure that my determination to do so will remain tenacious. The American Chestnut Foundation is successfully developing highly blight-resistant American chestnut trees through backcross breeding, and they will be releasing that long-awaited final product into the public domain when circumstances permit. I would invite everyone to obtain more information from TACF and to compensate me for my gifts to the community by supporting that organization with a membership. Please see also my article, New Hope for the American Chestnut, for detailed information on that species and on the promising effort to restore it to the forest canopy. I also am an avid gardener of native New England wildflowers and maintain native wildflower gardens at home and at the Acton Arboretum. My picture-article, The Wildflower Trail at the Acton Arboretum, provides an illustrated tour of this special garden and offers tips on how to cultivate a selection of attractive native species. Perhaps one day our children and grandchildren will stroll habitually along the familiar streets of their home towns and happen to glance at spectacular canopies composed largely of native chestnut and elm. As they struggle to see the clouds through the graceful, arching limbs and interweaving branches, perhaps they will vaguely remember a story, just as we now seem to recall faintly that our familiar gulls and geese were in danger of extinction not too many decades ago. Hopefully, our successors will be mindful of the important lessons that we have been slow to learn. We need to respect our natural environment, taking care to leave foreign organisms where they belong. We need to take the responsibility, ourselves, for repairing any damage that has been done, and never to take our native wildlife for granted again. Technical data on the Valley Forge, New Harmony, and Princeton elms. This 1995 report written by USDA research scientists shows the results of DED tolerance screening performed in the early 1990's on various American elm clones, including Valley Forge, New Harmony, and Princeton, as well as DED-resistant and susceptible controls. A more recent report on a seven-year study of these same clones is also available. Footnote about the Liberty elms. This page which I wrote in 2001 mentions sources of research notes and includes details on identifying the individual American Liberty clones. More recent field observations have strained my long-standing effort to remain unbiased in regard to the various cultivars. Evaluation of 19 American Elm Clones for Tolerance to Dutch Elm Disease. This research report was published in the Journal of Environmental Horticulture in March, 2005. DNA Fingerprinting of Clones and Hybrids of American Elm and Other Elm Species with AFLP Markers. This report was published in the Journal of Environmental Horticulture in September, 2005. I wish this particular report were easier for a non-scientist to follow, but at least it may shed some light on the nature and origin of the Jefferson elm. Valley Forge Elm Proves Itself in Acton, MA. This article describes in detail how one particular Valley Forge elm in Acton, Massachusetts contracted Dutch elm disease naturally and then recovered entirely on its own, demonstrating the DED tolerance of this variety. The Status of Elms in the Nursery Industry in 2000. This website summarizes data on most elm cultivars of current importance to the nursery industry in the United States. Parentage of named elm cultivars and hybrids. This chart illustrates the lineage of most elm cultivars that currently are available, hopefully helping to eliminate any confusion of American elm varieties with Asian or European hybrids. Comparison of the available American elm cultivars.This page outlines the important characteristics of each of the American elm cultivars that currently are available. "Can Cloning Save the American Elm?" by Zach St. George. Article in The Week on ongoing efforts to develop improved American elm cultivars, March 29, 2016. "American Elm Makes Slow Return," by Dennis Cauchon. USA Today article on American elm restoration, May 7, 2007. "Effort Grows to Restore Signature Elm," by Mark Sullivan. Boston Globe article on American elm restoration, June 2, 2002. Elms of Dartmouth College. A pictorial tour of the mature elm trees at Dartmouth College, Hanover, NH. Elm Tree Diseases. A resource for information on elm diseases in general. Elmpost Site Map. A comprehensive overview of the elmpost.org domain, with links to all contents which I maintain. This domain deals extensively with American elm restoration and also encompasses a variety of other interests. Feedback Form. Your input helps to keep the pages at this website accurate, functional, and up to date. Please note my choice of adjectives here, and feel free to comment on any item. � Please mark this site and check back soon. The photographs on this page may be distributed freely or re-published for wholesome purposes; in return, a credit link ("courtesy elmpost.org") is always appreciated.